A new presidential foundation made up of former presidents and prime ministers would create “synergy” between academics and “the popular wisdom” shared by society, the President said. 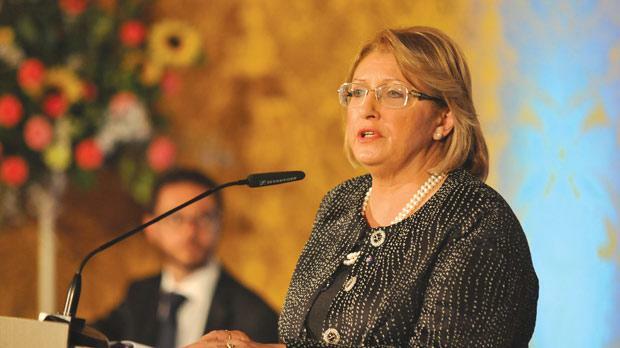 “I would like all of society to define social well-being so that we can understand how to achieve it,” Marie-Louise Coleiro Preca said, adding that the foundation was not aimed at allowing her to continue the work she had started as social solidarity minister. She was speaking during the signing of a deed officially launching the President’s Foundation for the Well-Being of Society, a non-profit organisation aimed at promoting social inclusion. The foundation rekindled a debate, started when Ms Coleiro Preca was touted for the position of Head of State last April. Then, Prime Minister Joseph Muscat had said the President would “stand up for her social agenda”. Dr Muscat said Ms Coleiro Preca would remain in charge of the national strategy against poverty and retain responsibility for a host of commissions, which had formed part of her remit when she was still a Cabinet minister. The suggestion had come under criticism from the Opposition, which raised concerns over the blurring of lines between the two different roles, noting this was not consonant with the Constitution. Dr Muscat later said the President would retain a consultative role but would not be responsible for any executive decisions. Asked if the foundation was a compromise aimed at allowing her to continue the work she had already started, Ms Coleiro Preca said: “I never compromise. I have my beliefs and principles and stand by them. I have always adapted myself to the different roles I occupied. The foundation will lead to the creation of a consul-tative council of governors that will include former presidents and prime ministers. University Rector Juanito Camilleri will also form part of the council, which is aimed at advising Ms Coleiro Preca on initiatives to help improve social inclusion and standards of living. The foundation will include four new national entities: the National Institute for Childhood; the Observatory for Living with Dignity; the National Family Research Centre; and the Centre for Freedom from Addiction. These, Ms Coleiro Preca said, would feature academics coming together with the public to discuss ways to address social issues.